Chart: Where does California's recreational marijuana supply come from? Chart: Where does California’s recreational marijuana supply come from? According to licensing data released by the California Department of Food and Agriculture, 1,192 of the 2,906 recreational cultivation licenses issued throughout the state – or 41% – were for outdoor grows. Relative to indoor and greenhouse facilities, the production capacity of outdoor growers is limited. They can harvest only once a year, and yields are generally lower given their complete reliance on Mother Nature to maintain temperature and control lighting conditions. Indoor and greenhouse growers, by contrast, are able to harvest multiple times a year. Onerous regulations or outright bans on outdoor cultivation sites by many California counties also have made it harder for outdoor grow operations to expand their footprints. Of the 26 counties in the state that have issued cultivation licenses to date, 14 haven’t awarded any to outdoor growers. More than half of all cultivation licenses issued in California went to businesses in two counties: Santa Barbara and Humboldt, both of which allow outdoor grow sites. Those counties account for approximately 42% of the state’s total production capacity. 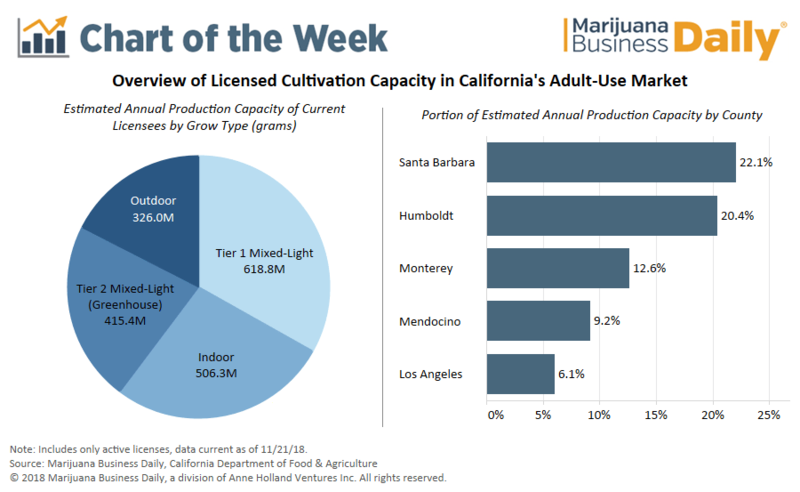 Santa Barbara County is also home to 13 of 20 of the largest cultivation operations in the state, with the average licensee holding nearly 13 grower licenses – well above the average of 1.4 licenses per licensee throughout the rest of the state. According to Kristin Nevedal, chair of the International Cannabis Farmers Association – a trade group that promotes sun-grown cannabis – Santa Barbara County has been a hotbed of cultivation activity because of the large amount of available greenhouse space. Tier 1 mixed-light facilities use 0 to 6 watts per square foot while Tier 2 mixed-light facilities use 7 to 25 watts per square foot. Tier 2 mixed-light facilities are generally enclosed, automated greenhouses that use high-intensity lights to assist in the flowering process. Tier 1 mixed-light facilities can be seasonal, open-air greenhouse structures that use artificial lights as a supplement to the sun, or outdoor grows utilizing tarps or other mechanisms to block sunlight from plants. In either case, these grow operations consume less energy than a Tier 2 mixed-light grow. Indoor grows are the most energy-intensive type of cultivation operation, using no natural sunlight and consuming more than 25 watts per square foot. Estimated annual production capacity was derived as a function of maximum cultivation space, estimated yield per square foot and estimated harvests per year for each type of cultivation license. Average yields of 30 grams per square foot were projected for indoor and tier 2 mixed-light facilities, and 20 grams per square foot for outdoor and Tier 1 mixed-light facilities. It was assumed that outdoor cultivators would harvest once a year, while Tier 1 mixed-light growers would harvest an average of three times per year and indoor and Tier 2 mixed-light growers would harvest an average of five times per year. Incorrect about mixed lighting. CDFA is reading outdoor light deprivation in greenhouses with 0 watts of light just using the sun as mix light. These farmers only get to harvest a year in Humboldt. CDFA has been interpreting the law incorrectly. This is going to have the effect in making it so Humboldt Farms can’t compete against those southern California Farms with the plug-and-play green houses. Typical over-regulation for the generation of revenues in direct violation of what the law says. Also don’t forget the acre cap was illegaly taken away and the then head of Cdfa Amber Morris quit at the same time. It’s a shame no news agencies are speaking about that topic! The consolidation of licenses should be ILLEGAL. This is not what prop64 intended, it was supposed to be an ACRE CANOPY EACH. Now these rich corporate backed grows are stacking licenses, there is no need for a single company to have so much acreage. LIMIT THE OUTDOOR AND MIXED LIGHT LICENSES, stop issueing so many permits. We are destined for a huge oversupply just like Oregon, we do NOT need anymore sungrown cannabis in california unless the interstate market opens up. Until then, every acre of greenhouse that gets licensed just floods the local market with another couple thousand pounds of mediocre quality product most of which just gets turned into extracts. Pretty soon you wont be able to give sungrown herb away, its almost as low valued as mexican brickpack once was! Dont become Oregon! Limit sungrown licenses, eliminate the stacking of licenses and cultivation operations larger than several acres. Al, anyone who is eligible to grow ( like almonds/walnuts ) should be able to. And, if sungrown is their only option ( the env. correct option ) then so be it. Let the marketplace largely dictate prices. You won’t see “low valued mexican brickpack..” under this scheme because the increased competition will eliminate that scenario. Yes, the prices will come down. But, for those that put out a superior sungrown product, a premium will be paid for that. Right? Eg; Run of the mill non-organic roma tomatoes sold at grocery store for .59 cents/lb vs well managed organically grown heirlooms going for $4.99/lb. That’s over an 8 fold difference. Now, the real question is: Are you willing to put in the effort into the superior product WHILE living in the USA, supposedly playing in a free market-place? That’s called the risk of doing business in any niche. Al, you can’t have your cake and eat it too. Unless of course, you are the state of ca. govt. We should be learning from Oregon, unless the borders are opening up, we are going to have a massive oversupply and then see illegal stuff like diversion to the Black for companies to survive. No reason to continue to issue sungrown canopy, oregon is already halting new licenses. I would like to know Californias total demand, they estimate oregon consumes about 500k lbs per year. CA is 8x the size so estimate an annual demand of 4million lbs? Judging by the numbers above, we are already almost at that number. Half of the growers in Oregon arent turning a profit, a quarter are going broke. They severely over licensed sungrown canopy in a market that only consumes 500k lbs on the rec market. They have stopped issuing new licenses. Washington and colorado seemed to have found a better balance allowing licenses but limiting them like some of the east coast states. If california consumes 4million LBs a year on the rec market (i dontknow this exact number) than the current licensees are already supplying close to this number. We have room for more businesses, and i hate barriers to entry and consolidation of large acre licenses, the BCC should approve more 5-22k sqft grows and stop issuing all of these 4-5 acre greenhouse permits. Well, Al, I think you made a fine argument if favor of and presenting some rationale of why the feds need to legalize it nationwide. Do you think most of these growers and other’s in the industry don’t see right through the veneer of the b.s. that state/local govts. have created to prop only themselves up, with the few businesses they choose to fatten their coffers? That’s why the black market thrives. The black market usu. thrives under these conditions. It has over time. Look at colonies for example. Spain ( and the U.S. ) had colonies whose purpose was to enrich the throne ( govt. ). The laws that are applied to colonies don’t apply to the colonized and visa versa. Eventually, it didn’t work out. But, big govts. don’t stop trying where they can do it, and try to get away w/it for as long as they can. Same’s happening w/the cannabis is being governed in this state. It was the black market ( black market forces ) that had a lot to do with why the economy of Spain eventually collapsed. Thriving black markets are a “screaming” canary in the tunnel, that’s something’s really wrong. Thriving black markets are society’s manner in voicing their rejection to extreme forms of governmental corruption. It’s just a matter of time before this “market” corrects itself, much more naturally. Greedy/Self-interested/personality disordered individual’s are usu the one’s that create these problems for the rest of society. So, I still stand by my sungrown proposition. ( Very few people should be growing indoors. ). It’s much better for the planet; ( Big oil/utilities lose. But, they never cared anyway and are a big part of the problem. ) and probably for the quality of the medicine produced. More opportunities for employment and innovation. Same idea would apply to hemp. The black marketeers, largely understand this concept. That they never had a chance under these conditions. In the savanna of the ca. landscape, how many of these antelope are taking their chances living in the midst of what they consider to be a paper lion? A truly cowardly lion, pulling the knobs and levers behind the curtain in the Land of Oz. The black marketeers don’t need Toto to pull away the curtain to all ready understand the truth of what’s really going on. Where’s the chart that shows where the recreational black market/illicit market marijuana supply come from? The title implies ALL ca, rec. supply. Wouldn’t that chart add much needed perspective on the totality being produced for this market? An educated guess would be fine. Why? Wouldn’t the state and it’s citizens and current licensees want to know? For all kinds of important reasons? ?